How much does a subsidized share cost? The regular cost of a 2019 Summer Vegetable Share is $570, but if you qualify for a subsidized share, your cost is only $276 for a full share or $138 for a half share. The regular cost of a 2019 Summer Fruit Share is $96, but if you qualify for a subsidized share, you pay $46 for a full share or $23 for a half share. What if I can’t pay the cost of a subsidized share all at once when signing up? What happens if I apply for a subsidized share, but do not qualify? Can I still buy a vegetable share at the regular cost? Yes, the process has been arranged so that those who do not qualify, but would still like to purchase a share at full cost, will be able to do so. Do you offer a subsidized winter share? At the moment, folks with a subsidized summer share have the option of signing up for a subsidized winter share. Yes. Subsidized share members can order items from Lewis Waite Farm. These items will be at full cost. Are additional product shares subsidized? We currently only offer subsidy for our main shares. If you’re interested in finding out more info if that changes, contact our subsidy coordinator. Do I have to be a resident of Sunnyside to be a subsidy member? No, you do not have to be a resident of Sunnyside. Many of our members are from neighboring communities. Absolutely all subsidy applications are kept strictly confidential. Only the subsidy coordinator has access to the application information. Sunnyside CSA does not sell any information submitted. 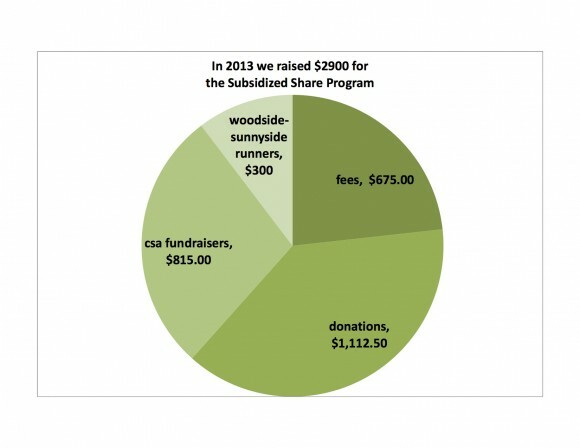 All of the money comes from CSA members via fees, donations or fundraisers. This chart shows a distribution from a previous year.